Beer has long been a part of German culture. In fact, today Germany is globally ranked third in terms of per-capita beer consumption. So take a tour around New Ulm and taste the culture! We care about your safety, so please drink responsibly! Next enjoy the scenic drive out to Morgan Creek Vineyards to sample wines from Minnesota’s only underground winery! Order a wine flight and choose your samples from their many delicious varieties! Wine not your thing? They serve Schell’s beer too. Stop for lunch and a pint at Turner Hall, the oldest bar in Minnesota! Head to the historic Rathskeller Bar and check out the murals on the walls which date back to the 1870s! These German murals were covered during WWI and hidden for 81 years until they were restored! You can sit right next to them as you enjoy some delicious German or American food, and a drink from this historic bar. 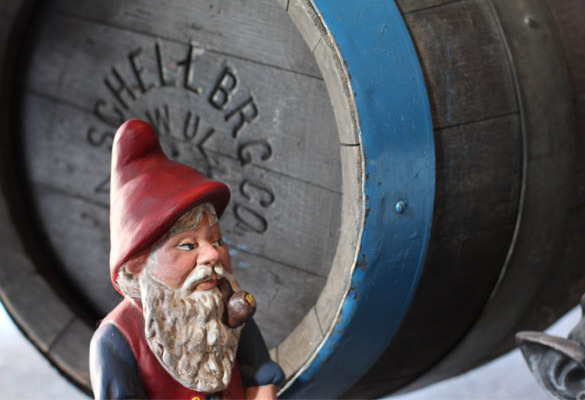 After lunch, head to one of the most popular tourist attractions in New Ulm: Schell’s Brewery. The tour here is not to be missed! Schell’s has been brewing German craft beer since 1860 and the tasting after the tour is well worth the $5 price of admission! After the brewery, you may decide to take a break (and a nap!) before continuing your adventure. That’s ok! Or you might want to head to the new Starkeller Brewery & Taproom! Begun in 2017, this is the latest venture for Schell's Brewmaster Jace Marti. Sample sour beers from the Noble Star line in a tap room lined with impressive 1936 cypress wood tanks and reclaimed and re-purposed brewery antique items. When you’re refreshed, get ready for a fun evening of music and drinks at the Grand Kabaret. The exposed brick walls of this historic building make excellent acoustics for the live music every Friday and Saturday. If you enjoy unique experiences, you'll want to search out The Retz 227 - New Ulm's new speakeasy bar! If you can find it, you might question whether you are still in New Ulm when you step into this modern speakeasy atmosphere. Not ready to call it a night? Keep the fun going! There are many watering holes within walking distance of the Grand Kabaret, and others all over town!